Hoodoo Man Blues is not only Junior Well’s initial LP Appearance, it is damn near the first LP by a Chicago blues band. Chess and a few other labels had reissued 45’s by Muddy Waters, Sonny Boy Williamson, Howling Wolf, Jimmy Reed, Elmore James, etc. but virtually no one had tried to capture the Chicago blues sound, free of limitations of juke-box/airplay promotion. 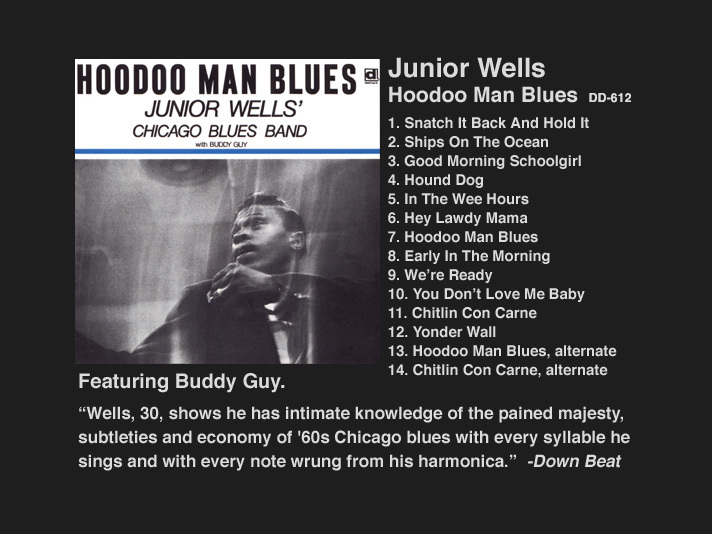 Delmark is proud of the part Hoodoo Man Blues played in the popularization of the real Chicago blues and of Junior Wells. But the credit belongs to Junior, Buddy, Jack and Billy – they made the music. We just sat and dug it.